Amy’s Bread is a popular New York City bakery that opened in 1992. Amy Scherber started the operation in Hell’s Kitchen and has expanded to include locations in Chelsea Market and The Village. Scherber’s first book Amy’s Bread (1996) focused on her artisan breads and will come out in a revised edition in December 2009. 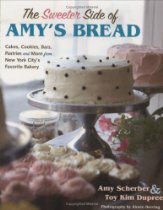 The Sweeter Side of Amy’s Bread (Wiley 2008) is the follow on book, which showcases the cakes, muffins, biscuits, sweet breads, and cookies that keep customers coming back for more. Simply Delicious Yellow Cake (the basis for her famous “pink cake”) and Sweet Pink Buttercream Frosting. All the recipes are written in grams, ounces, and U.S. volume measurements, helpful for anyone accustomed to cooking with one measurement type. Each recipe has a Tips & Techniques section with helpful information and some have stories about the recipe development. Scherber also added a useful section on Ingredients & Equipment that shares her insights on what to use in the kitchen, and included a handy chart with protein percentages for 16 different flours commonly sold in grocery stores around the country. Interspersed with the recipes and delicious photos are stories about the patrons of Amy’s Bread, my favorite being Frances Rehfeld, a lively centenarian and fan of the Definitely Devil’s Food Cake. 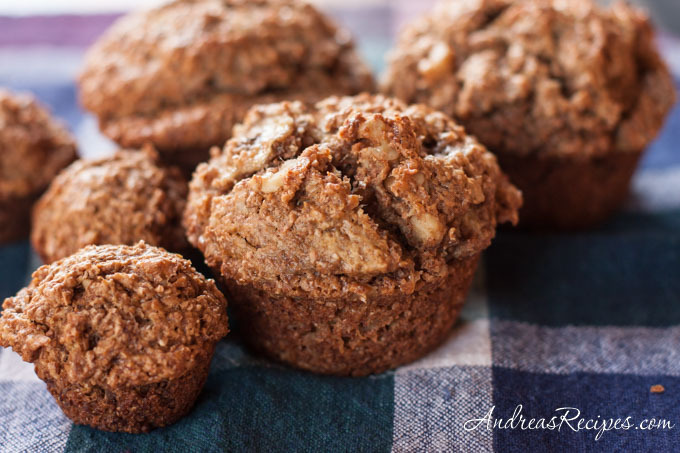 I made the Banana Bran Muffins with Toasted Walnuts, which were hearty with lots of banana flavor. They are large bakery size, overflowing a standard muffin pan, and one is filling enough for breakfast or a snack. I found plenty of other tempting treats to try, such as the Plum Upside Down Cake and the Apple Walnut Cake with Maple Syrup Buttercream, any of which would make a good dessert for a dinner party or pot luck.